Born Milwaukee, Wisconsin, May 14, 1986; married; 2 children. Graduate Bay View High School; attended University of Wisconsin-Milwaukee. 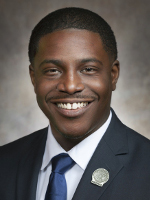 Former executive assistant/policy director to Senator Nikiya Harris Dodd, Wisconsin Legislature; legislative assistant to Milwaukee County Supervisor Nikiya Harris; field organizer for the Democratic Party of Wisconsin; African American statewide organizer for Feingold Senate Committee. Member: ACLU-Milwaukee Chapter Board (chair 2014–16); YMCA of Greater Milwaukee; Americorps/Public Allies Alumni; Prince Hall F&A Mason, Asher Lodge #7; Urban League of Young Professionals; Community Brainstorming Conference; NAACP.